Looking for something a little exotic for dinner tonight? But without a lot of fuss? Then you have to try this Tofu Mushroom Curry from Archana’s Kitchen. The Ginger Mustard Sauce is to die for. I was browsing the internet last night looking for simple rice dishes to cook and ran across this recipe from Archana’s Kitchen. I am not much of a curry guy, nor am I a tofu guy, but I had all the ingredients on hand, and the mustard sauce sounded interesting so I gave it a go. So simple to make but yet so flavorful. I’ll admit the Ginger Mustard Sauce is what intrigued me. As it turns out, it’s simply a slurry of corn starch and water with a little Dijon Mustard and Soy Sauce whisked in. It sounds like an odd mixture to a country boy like me, but when you pour this sauce into your pot, it thickens up nicely into a really tasty sauce that makes this whole dish just pop. The recipe also calls for a tablespoon of honey. If you’re an anti-honey vegan, you can probably sub in a tablespoon of agave nectar or maybe even maple syrup. I left out the oil in the original recipe and had no problems sautéing my veggies. The Sesame Seed/Honey mixture was the perfect base to sauce all my veggies and of course the mushrooms will add a bit of their own liquid as well. The honey adds just the right amount of sweetness to counter the tartness of the mustard sauce. I served this over rice, but I can easily see this used as a topper for noodles or even a baked potato too. Thanks Archana – I can definitely see this added to my weekly rotation. 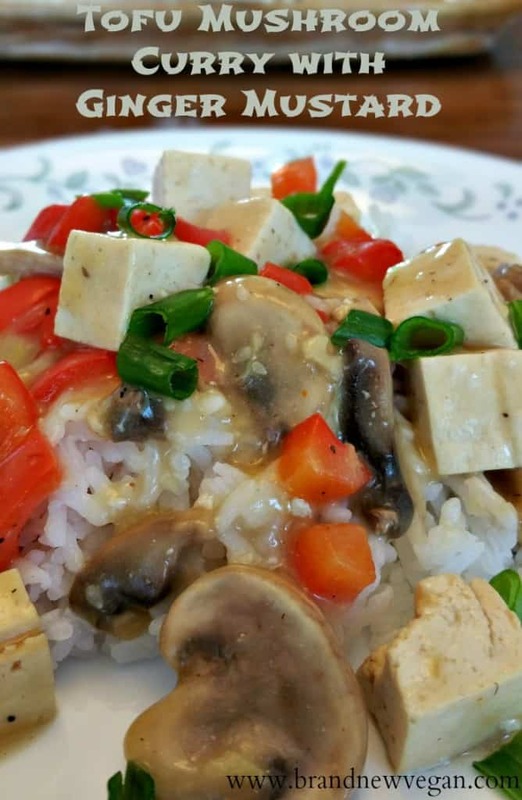 This Mushrooms Tofu Curry in a Ginger Mustard Sauce is a 1 pot dish that comes together in 30 minutes or less. Serve over rice for a quick & easy dinner. Combine the corn starch and water. Whisk until there's no lumps remaining. Add mustard, soy sauce, salt, pepper, and chile flakes. Whisk thoroughly and set aside. Heat the honey in a non-stick pan until it liquifies. Add in sesame seeds and stir until bubbly. Slowly stir in sauce and cook over medium low heat until thickened. Serve over rice or noodles. Garnish with sliced green onions.